You may control the light coming into your home as little or as much as you would like. Step one in accomplishing this is to really consider how you use your rooms. Instead of thinking you always wanted a light filled living room to entertain in, but in reality you just use it to watch your recorded shows late at night. The idea of naturally rising in the morning along with the emerging sun sounds inspiring, but you also have a hard time falling asleep because the streetlights are too bright or the neighbors’ car headlights shine directly into your room. Regardless of how much illumination you desire or require in a space, you can easily control the light with window treatments. Any type of sheer treatment is an enchanting addition to a window. Sheer drapery never fails to provide a dreamy, classic look. 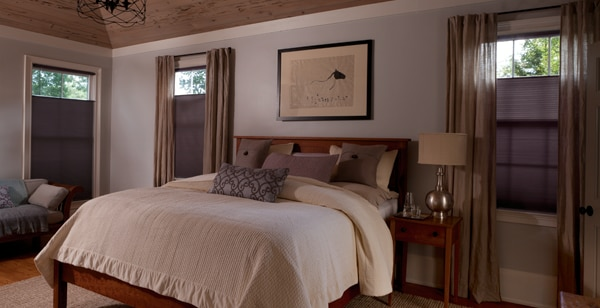 While plenty of light will still fill the room, it will be softly filtered and create a calm, comforting glow. Due to their translucent nature, sheer treatments are best suited for rooms where privacy isn’t a concern. If you love the look of a sheer but would like to have a bit more privacy and light control than sheer drapery panels can provide, sheer shades are an alluring solution. A combination of a sheer drapery and a blind, creates a delicate but structured appearance. Even more choices come in the form of light filtering or room darkening options. Light filtering refers to the opacity of semi-opaque blinds and shades and falls somewhere in between sheer and blackout. These treatments provide privacy for spaces like bathrooms and front-facing rooms of the house as well as dramatically decreasing the incoming light. Extremely popular, inside mount light filtering blinds and shades become even more flexible in their light control when paired with an outside mount Roman shade or drapery panels. Putting a semi-opaque treatment on a window reminds me of finding a shady spot under a big leafy tree on a hot sunny day. You don’t want to necessarily go indoors, but you do crave an occasional respite from the harsh sun. If you’re looking to absolutely block the majority of incoming light and ensure complete privacy, room darkening shades are a smart choice, but they won’t necessarily turn your room into a black cave. Room darkening is a tricky term in the world of window coverings. In order for most shades to fit into your window frame, they need to be made with a slightly smaller width to guarantee a proper fit. If a shade was the exact same size as your window opening, it would not be able to nestle inside your frame. The result is an ever so slight gap that light creeps around, creating a glow around the shade, the “halo effect.” Shades that are mounted higher and wider than your window frame, also called outside mount, will block a bit more of the halo of light seeping in. Another window treatment idea to help with any light infiltration is the quick installation of room darkening drapery panels. These will easily cover up the slim space where the window treatment and the edge of the window frame meet. Some people are so sensitive to light that the shine of a full moon can easily keep them awake into the wee hours of the morning. These individuals would deeply benefit from a blackout shade covering the bedroom windows. True blackout shades typically have some sort of sidetrack to trap any light coming in around the edges of the window. A perfect example is the SlumberShade, which is essentially just a blackout shade. The only difference is it includes a black lined sidetrack, which absorbs the light trying to bounce around the edges of the shade, as well as a fuzzy strip attached to the blind’s headrail to ensure no light comes through over the top of the shade. Just like you utilize different types of lighting throughout your home, such as soft ambient light in your living room and direct task lighting in your kitchen, you can control the amount of light you would prefer to come into different rooms with select window treatments. A pitch black bedroom, a home office without glare, and a bright yet private kitchen can all be created by controlling the light with window treatments.